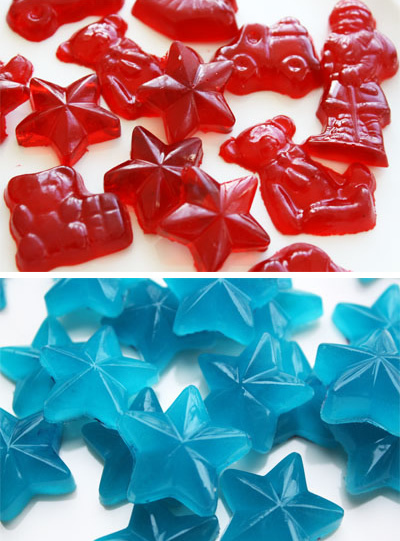 Gummy candies have long been the favourite dessert of kids as well as elders all over the world. You can easily buy these candies in different shapes at your nearest store, but did you know you can make your very own gummy candies at home? Open up all the seven envelopes of unflavoured gelatine in a medium size mixing bowl. Add a small box of jello to it and mix them thoroughly. Add ½ cup of water to the powdered mixture and mix well. At this staged it might be lumpy, but don’t add additional water since the mixture will smooth out once you will start heating. Shift the mixture to a saucepan. Place the saucepan over medium heat and stir continuously until the gelatine has melted completely (will take about 3 to 5 minutes). Do not allow this mixture to boil however. When all the gelatine has dissolved and the mixture is still in liquid form, take it off the flame for cooling. Let the mixture cool for a minute and shift it to a container that is easy to pour from, such as a small ceramic creamer pitcher. Pour this molten gelatine mixture into candy moulds of different shapes and sizes. Let the mixture cool completely (will take almost 20 minutes) so the candies can take proper shape and form. Take the candies out of the mould and enjoy.